Amacord has been showing at the Bloor Cinema since yesterday, and since I’m bored and procrastinating, I’ve posted screen caps of the movie. Anyway, kinda wish I didn’t catch screen caps before watching the movie because it ruined the surprise. Thank God I can’t understand Italian. I’m actually watching it today at 7. See you there! Last Saturday, TCM was showing “The Searchers,” the king of all westerns that I can’t blog about for my own neurotic reasons. Fortunately I can tie it into a movie that was on Bravo Canada the night/morning after – Gone Baby Gone. It did come out in a year that overflowed with proper Western films. And both have missing children and gun-toting! So is Gone Baby Gone a western? It’s not a noir because there are hardly if ever any child abductions in that genre. Noir’s a very adult genre, focusing on an underworld that only seeps into the domestic areas in one or two instances. Dorchester’s both an underbelly and a residential neighborhood, on the other than there’s a separation between those two worlds that the precedent in both genres show. And there’s not enough shadow in the movie. Conversely, There has been a school of thought that believes that the 1970’s urban landscape, particularly New York City, was the new frontier (There’s also a documentary about the post-1967 depiction of police in cinema which I can’t find that talks about this too. It was on AMC.). Our hero Patrick Kenzie (Casey Affleck) introduces the film by narrating about what that the people of Dorchester believe in, patriotism and family values, just like the old West. Dorchester in the 2000’s is a multicultural environment that’s a bit like the West. The film also has two bar fight scenes that involve guns, another thing it has in common with the genre. Yet it doesn’t have the newness nor the relatively hospitable feel nor the desire for purgation that the Western genre evokes. “It’s the things that you don’t choose that make you who you are, ” Patrick says, and he continues with “I’ve lived in this block my whole life, most of these people have.” The neighborhood can either only not change or decay, and we can say the same about its inhabitants. And it’s easy enough to compare the characters of Gone Baby Gone‘s with that of “The Searchers.” Patrick is the Martin Pawley, our dutiful moral compass. Both are hybrid characters – they are despised in one society and is a stranger to another. Both are men infiltrating a seedy environment, believe in an idealized world with order, and can pistol-whip their enemies even though they don’t look it. Patrick’s more level-headed than Martin, but both are equally capable of making tactical mistakes with dangerous strangers. And Patrick’s more hesitant in killing criminals than Martin is. His girlfriend Angie Gennaro (Michelle Monaghan) is the domestic, moral yet brainwashed Laurie Jorgensen. Both represent the mainstream morality of their time. Both are equally prone to saying ruthlessly horrific things about the other characters and unhesitatingly condemn to those whom they think are beneath them. But obviously, Laurie will never jump into a quarry to try to save another woman’s child. Remy Bressant (Ed Harris) is Ethan Edwards, both of whom are psychopaths who have suspicious origins and histories and are constantly abusing their powers under a badge. Both also have skewered worldviews – children might forgive, Mr. Bressant, but they don’t forget. Both also know their enemies like experts. Amanda MacCready is Debbie Edwards, both of whom fit better with those who have abducted them, who fit better in an idealized world that the protagonists are willing to destroy. Their return to their homes are open-ended, at least more so with Amanda’s. And Jack Doyle (Morgan Freeman)? Spoiler, but he’s a dop-pel-gang-er! Helene MacCready (Amy Ryan, nominated for an Academy Award for the role) is a different animal, or at least someone who belongs to the Noir tradition. The scene where she recalls her daughter’s supposed last words has revolting implications. She’s irredeemable. The most horrifying thing about her character is that she’s only capable of promising change in times of crisis. When Patrick restores order for her benefit, she can’t even fake joy for this reunion, not even for the cameras. She leaves her daughter like she does every day, returns to her old, drug addled ways. 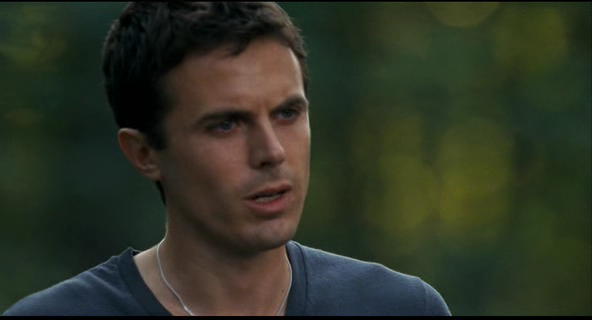 Also, both “The Searchers” and Gone Baby Gone tend towards deluded ethics based on wobbly rhetoric. 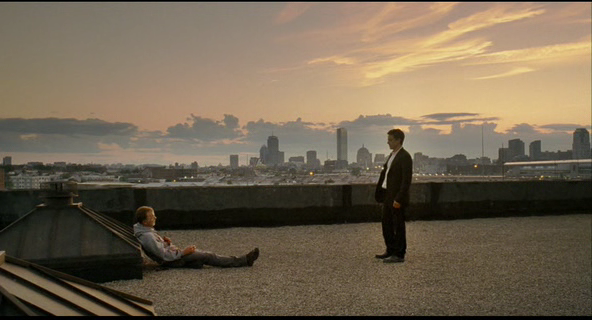 The denouement of Gone Baby Gone, when Patrick finally confronts Amanda’s real kidnapper, he prattles on with a speech about that what’s better for the child is not right for the child. Both Patrick and the kidnapper try to speak on the child’s behalf, a dangerous thing to do. Patrick even speaks like this in front of Angie. In most of the film, I felt that its grit outweighs it sentimentality, but this scene makes both influences present, for better or worse. Both the kidnapper’s words and delivery seem more sane that Patrick’s idealism, or maybe Affleck (director or star) might be misguided during this particular stage of the character. Lars just told me that Gone Baby Gone is the last of a series of four books in a series by pulp writer Dennis Lehane. Explains the speeches. And don’t mistake me, I like the movie. I would have loved it would those few scenes.